Each Member Will Probably Contribute. A private landing one hundred and fifty feet in length is being built on the northern end of Arthur Palmer's wharf for the South Harpswell Yacht Club. The members of the club have long needed this pier and now that the project is assured they are enthusiastic over the fine opportunity they will have to dock their boats and entertain their friends. A club building will be put up on the shore end of the landing and each member will have a key. A large float and convenient steps will add to the convenience of the landing. The carpenter and pier work is being done by local carpenters: A celebration of considerable proportions will be looked for when the new landing is completed and dedicated. The rumor that a yacht club was in process of formation at South Harpswel1 is confirmed with the news that three well known gentlemen of the point have started the club with a $25.00 subscription each, and that a pier a small club house will be erected on the shore front just north of the Merriconeag barber shop. A pennant is being designed by, Judge Charles P. Sherman for the new club, he with Mr. L. H. Spaulding and Mr. Fred Watson being, 'the original promoters of the idea. '*The privileges of the club will be for members only and the plans at present include yachting, regattas all through the summer! A South Harpswell yacht club-has been a need that has been more and more acutely felt every year. The 'name of the club has not yet been announced, but it may be assured a hearty support from all who are interested in yachting in this section. Dr. E. A. Austin arrived Saturday morning for a few days' trip spending tie time until Tuesday at his cottage w4h his family who are summering here. His new motor boat was launched Saturday. Messrs. J. A. Blake and J. G. Bridge of the colony came down from Boston Saturday in the early morning boat. Mr. Blake spends the weekend here returning to Boston each week to attend to his business. Mrs. Eldridge G. Pinkham and Miss Hattie Pinkham spent Friday in Portland. The steam launch Seminole is in commission again. Mr. Osceola Currier, the owner, arrived some ten days ago. The launch has a new set of canvas curtains this year and is looking; neat and trim. Mrs. Currier and daughter arrived Tuesday of last week from Newark. Mr. and Mrs. Robert S. Thomes of Portland, with Miss Aubigne Thomes, Mr. Everett Drummond, president of the Waterville Savings bank, Mrs.. Anna Drummond, Mrs. Abigne Wyman, Miss Hildegard Drummond, were at the Merriconeag house to dinner Thursday and spent the afternoon at the point. The Brackett's of Boston are at their cottage, formerly the Abijah Stover place. Mr. Brackett has remodeled it finely and has placed a large plate glass window in the south side giving a fine outlook. A. E. Pinkham has just purchased five more new horses for his use in his stable and livery business, which is largely increasing. Between the new store and the old wharf was the Yacht Club building and floating wharf. 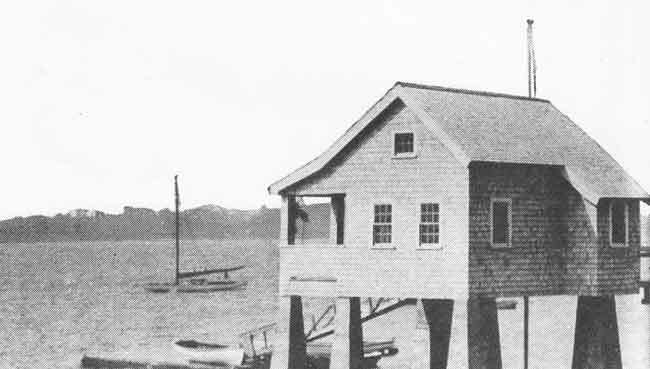 This building was sold to Marjorie Huse of Georgetown, Mass., who moved it down to Point and made it over into a cottage. It was a square yacht club at the head of the public floating wharf - she bought it and Ed Randall moved it for her in. They backed a skow up to the shore, lowered the house on it and towed it to the Point. Pulled it up over the bank and she put a small addition on the back for a kitchenette 4' x 6' 4 - a small tack hall and a small room for a chemical closet. Later she put a 16' addition on the south end for 2 bedrooms.